It should be fairly obvious from the outset that the name of this album/EP (I’m never sure of the distinction when a recording is seven tracks) is ironic. No band in their right mind (at least, not an indie band) would make such a bold statement. In fact, Fevers, an Ottawa group that blends electronics and indie-rock sounds, are actually full of passion. The EP’s opening track, “Passion is Dead (Long Live Fashion)” is a swirling landscape of electronics, and you’re hit immediately with a huge wave of sound. At times the use of synths reminded me of something Crystal Castles might do, but the two bands aren’t even remotely compatible. The vocals from Sarah Bradley are more like the vocals of Denise Nouvion of Memoryhouse. As Bradley sings “Passion is dead, long live fashion” you’ll understand the irony of the album title. “Straighter Line” features Bradley’s vocals closely tied with another group member, making for a great intro. Midway through the songs, the electronics start to get really heavy, but the band manages to steer itself away from falling onto the cheesy electronics you hear in mainstream pop nowadays. One of the strongest songs on the recording, “End of Love Song,” is next. It’s an intensely emotional and heavy song. There was something about the way that Bradley sang “All my atoms sing out loud” that evoked an emotional response from me. As well, the high-pitched sound of what I think is a guitar adds to the prettiness. Then there’s the verbosely-titled “My Heart is in a Basket on the Front of Your Bicycle” which is actually a more straightforward pop-rock number, made very pleasant again by Bradley and featuring little electronics. “Sugar Rush,” despite its name that would imply energy, is actually a darker, more atmospheric tune. The contrast was definitely intended. Finally, the EP ends with the seven-minute “Sort It Out” which more or less has two parts. The first half is a slowed-down, emotional melody with very little musical accompaniment. About halfway through, as I expected, the dynamics suddenly go way up for a long jam session to end the EP. Fevers have definitely got something good going here. They’re planning to release something new in 2012 so I hope they can hold onto their momentum. 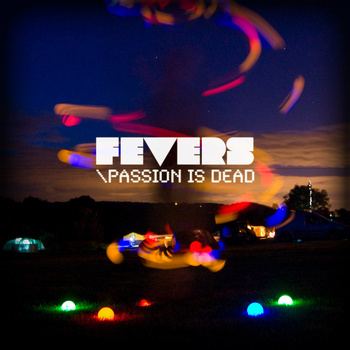 Passion is Dead is a FREE Bandcamp download.